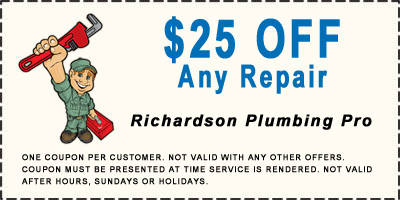 Richardson Plumbing Pro is the company to call when you need professional repairs to any make or model plumbing system. We can also install a better, more efficient system if needed. Our Richardson plumbing technicians will listen to you and assess your water heating needs, and help you choose a system that meets your requirements. Increase your comfort and lower energy costs with a new system. Whatever your Richardson plumbing needs, you can be sure that our skilled technicians will quickly and efficiently deliver the results you want – with courtesy and respect. Whether you need a new faucet installed or a whole house re-piped, you can rely on Richardson Plumbing Pro to do the job to industry standards. We promise honest and dependable service, and our reasonable rates are suited to your needs. From laundry rooms to kitchen and bath remodels, our work is neat, clean and respectful of your home and its surroundings. Replacing old equipment with more efficient, equipment is one way to save energy and money. Supplying and disposing of water in your home can include properly maintaining your existing equipment, adjusting your water heater thermostat, finding and sealing leaks, tightening your faucets, and more. Individual actions at home can reduce the amount of wasted water. What Did the Winter Freeze Do to Your Pipes? 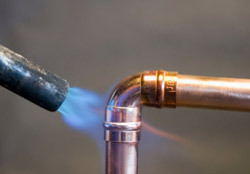 Now is the time to determine any damage to your plumbing system from the winter freeze. Open and close all exterior faucets to check for leaks inside the walls. Also, we recommend you walk around your yard to check for soggy areas in the soil. Another good place to examine is the water shut off valve to the house. Don't wait because serious damage to your home can occur. 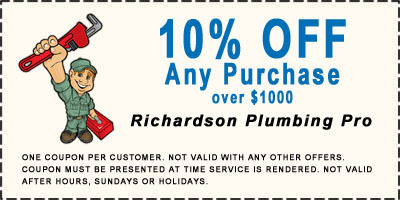 Call us today at 972-546-2974 for all of your Richardson plumbing needs. Toilets account for nearly 30 percent of your indoor water use. If we installed water efficient appliances, the U.S. would save more than 3 trillion gallons of water per year. Some toilets can be adjusted to use less water per flush. The typical single family home uses 69.3 gallons of water per day. A person needs approximately ½ gallon of water per day to survive. Q: How often do I need to service my water heater? 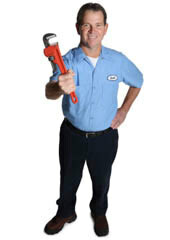 A: Most manufacturers recommend routine maintenance of your Richardson water heater. Some require maintenance records to comply with the warranty. Regular, routine maintenance keeps your system operating at peak efficiency, which saves energy and helps reduce utility bills. Q: Does bottled water ever go bad? A: Water that has been bottled and stored properly should last indefinitely, according to the International Bottled Water Association. Assuming it has been treated by the bottler according to guidelines set by the Food and Drug Administration, bottled water should contain nothing to attract and grow pathogens that could pose a threat to human health. To preserve taste, the Bottled Water Association recommends storing bottles in a cool, dry place, away from odors or toxic substances. Q: I think I smell sewer gas in my home. Is this dangerous? A: Sewer gas contains methane, which is highly combustible and may be fatal. Not only does your home smell like a sewer, but this problem can lead to serious health hazards. 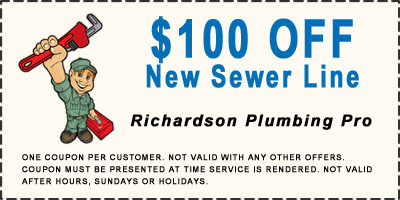 If you are smelling sewer gas in your home, you should contact your Richardson plumbing service immediately. Q: How can I tell if I have a leak? A: A higher than normal water bill might be your first indication of a leaking pipe. Or you might hear the sound of running water even when all your fixtures are turned off. When you suspect a leak, check the fixtures to make sure all the faucets are tightly closed and make sure no appliances are using water. Then, go to the water meter if you have one. If the dial is moving, you're losing water somewhere in the system. If you have a slow leak you may not be able to see the meter moving, you may have to take note of the current meter reading and go back and check it at a later time. Remember that your measurement will be off if you or any appliances use water during the waiting period. 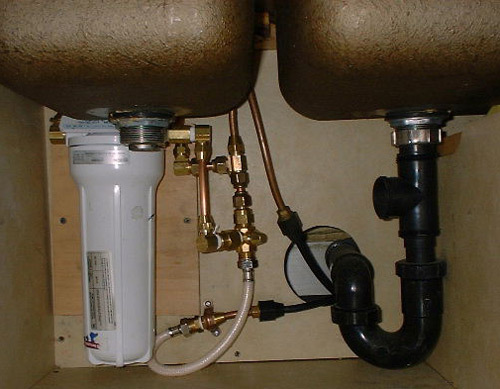 Q: Are under the sink water filtration systems effective? A: Absolutely. Most under sink units use carbon filters that are very effective in reducing common odors and bad taste. In the summer, water filtration is even more helpful because of algae growth during warm months. 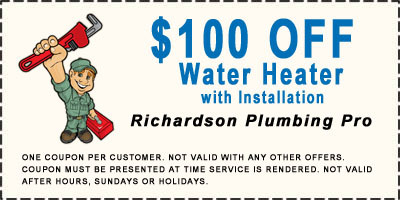 For help with all your water filtration needs give your trusted Richardson plumbers a call today. Q: Why does extreme summer heat cause underground pipes to break? A: The issue is not the heat but the dry soil associated with the heat. Our expansive clay soil in the area shifts which in turn causes water lines to break. There is little a homeowner can do to stop this problem. However, the faster you repair a leak, the less likely damage to your home or property will occur.